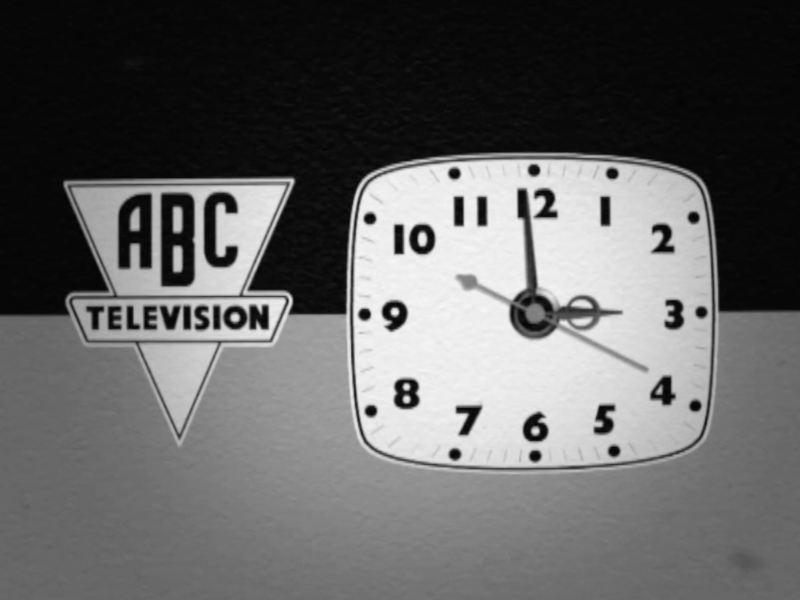 For this feature, we’ve combined the memories of Kif Bowden-Smith and Alan Keeling with an audio sketch from ABC’s Presentation Manager Geoffrey Lugg recorded in 1970 and the graphic design talents of the amazing Dave Jeffery to try to recreate ABC’s first on-air clock from 1956. Three clocks, in fact. Geoffrey describes the clock face, telling us about the hands, the numerals and the mechanism – but he mentions no logo on the clock. From his description, this is the clock in question. 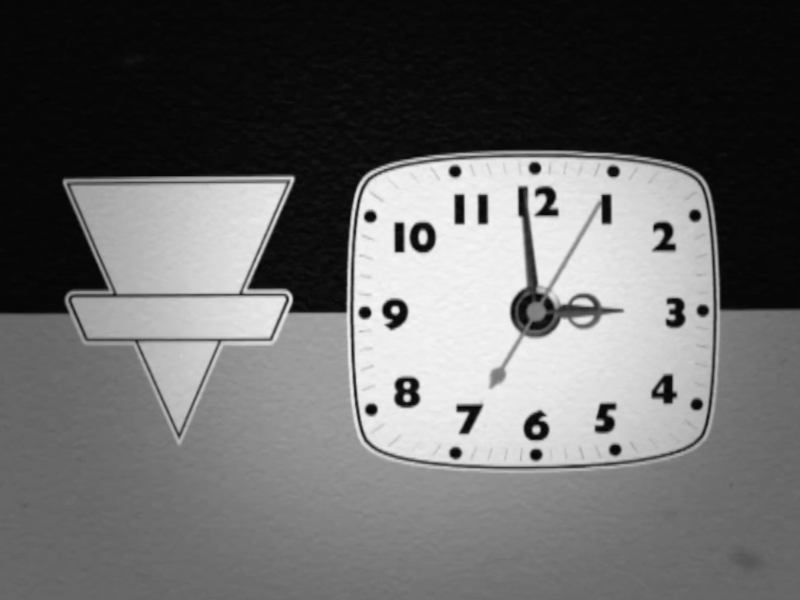 That clock coincides with Kif and Alan’s memories of the clock itself, with the proviso that neither of them can remember if the grey was at the top or the bottom – Geoffrey doesn’t specify. But what Kif and Alan both remember is the ABC shield to one side of the clock face. This isn’t described by Geoffrey, but then he’s answering a question (“will you describe the first ABC clock?”) literally: it didn’t occur to us to ask if he could describe the frame the clock was set in! Combining Geoffrey’s clock face with Kif and Alan’s logo recollection produces this clock. But here Alan has a conflicting memory: he is sure he saw the same clock but without the words “ABC Television” written in the shield device. Kif also has a vague memory of this. What they couldn’t explain was why this would happen, and both therefore doubted the result. Here’s that clock. Transdiffusion has done further research into this to try to track down why two clocks would exist with such a strange difference. The answer turns out to be “Clock Spots”. Advertising on early ITV was expensive: there was little room for it – six minutes in each hour, with a mere 7 hours on air each day – creating a supply and demand imbalance. The Independent Television Authority (ITA) and the government, via the General Post Office, were keen that local businesses, regional brands (very common at the time) and medium-sized companies should get access to the airwaves at a price they could afford. One solution was “admags”, regular 15 minute programmes with a presenter looking at products and services available in the region, sometimes chatting with the manufacturer or shopkeeper themselves, which cut the expense of producing an advertisement to almost nothing and allowed local companies in. But what about the regional brands and medium-sized businesses? They could afford an advert but not a slot to show it; or the slot but not the advert. Their products and services were often hard to advertise in an admag, with little to be said other than to show the thing to the camera and be done with it. 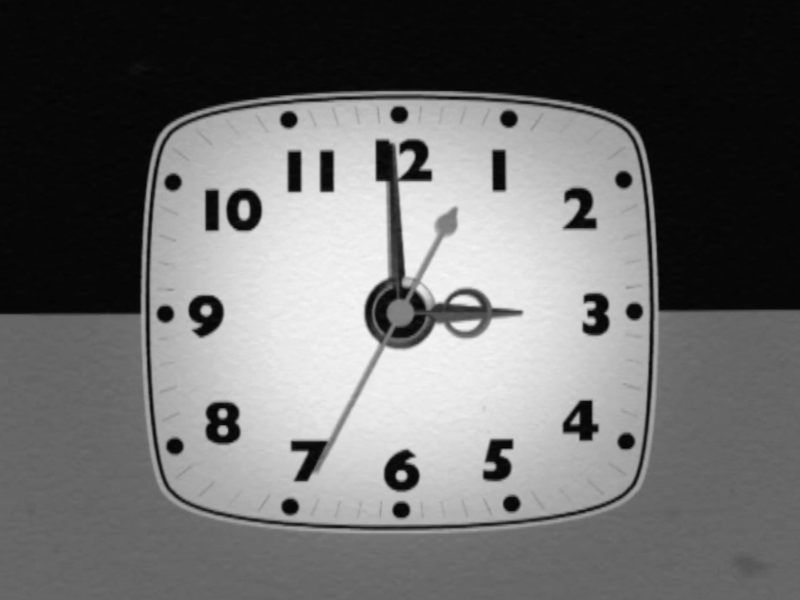 These potential advertisers were covered by “Clock Spots” – seven seconds of advertising slotted into the presentation of the station, treated as a separate item rather than a full advert. The station could cut to the clock – important in the days before it was common to have an accurate timepiece in most homes – at around 20 seconds to the hour, let the clock tick for 5 seconds, then cut to a 7 second advert (or spend 7 seconds with the announcer reading the copy over the clock ticking). Coming back from the advert left 8 seconds – enough for a namecheck for the station and an announcement into the next programme. This was a television version of what Radio Eirann and Radio Luxembourg did with their timechecks – Luxembourg’s “The time now by my H Samuel Everite watch is… [jingle]…you’re right on time with Everite!” becoming famous in its own right. But this presented the ITA with a problem: these “Clock Spots” looked like the product in question was sponsoring the station as a whole, or perhaps the next programme. This practice was illegal under the Television Act 1954 that set up ITV, and while it wasn’t happening, that it looked like it might be was damning in the ITA’s eyes. The fix to this problem was to debrand the clock before the “Clock Spot” – that way, the clock was being sponsored, not the station. This may seem like a strange set of hoops to jump through, but Independent Television was new and unsure of its feet; opposition from the Labour party to the entire concept of commercial television, which would persist into the 1960s, threatened the abolition of ITV should Labour come to power in any forthcoming election – antagonising opposition backbenchers by even seeming to break the spirit of the Act could be the ITA signing its own death warrant. “Clock Spots” did not last long, with the ITA and the programme companies finding they broke the flow of presentation and damaged what we would now call the “branding” of the station; additionally, the price of “Clock Spots” rose as demand grew, until they were close to the cost of a 7-second ‘voice to slide’ advert (nicknamed “chipshop corner”) in an ordinary break anyway. Admags would disappear in 1963, abolished on the orders of the Postmaster General at the time of the Pilkington Report. Dave Jeffery is a graphic designer and animator. His work is showcased on his YouTube channel. Alan Keeling is a television historian with an encyclopaedic knowledge of 1950s and 1960s British broadcasting. Geoffrey Lugg was head of presentation at ABC and later Thames Television. Until July 1959 time spots were not counted within the maximum per-hour advertising. When this became part of the normal advertising time the intrusion was thought to be annoying with no benefits to the companies, and these spots were formally discontinued on 1 January 1961.